I hope you had a fantastic 4th of July weekend! There’s a good chance if you hosted a party, that you have some leftover hamburger or hot dog buns lying around. What were you planning on doing with them? Bread crumbs? Great idea. Croutons? Another great idea. Putting them in the freezer for the next time you make burgers or dogs? Good luck with that one. My freezer is basically one-third buns. They’re all freezer-burned too, because I was lazy and threw the bags in there and didn’t bother to wrap the buns tightly in foil first. And my kids reject previously frozen buns. They would rather eat a hot bog or a burger without a bun over one that has been previously frozen. It’s kind of annoying since we’re a family of 5 and you can’t buy a bag of 5 buns. And I cannot handle wasting food, even a silly hamburger bun. So I came up with this strata using leftover hamburger buns that had been sitting in my freezer and that I absolutely knew would end up in the compost bin. 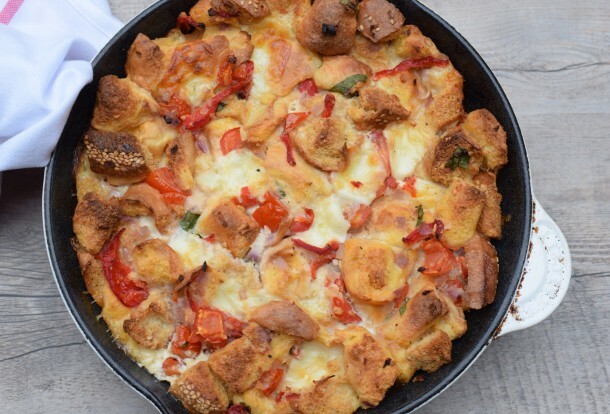 Stratas are kind of like savory bread puddings, more bread-y than an egg-y quiche or frittata . 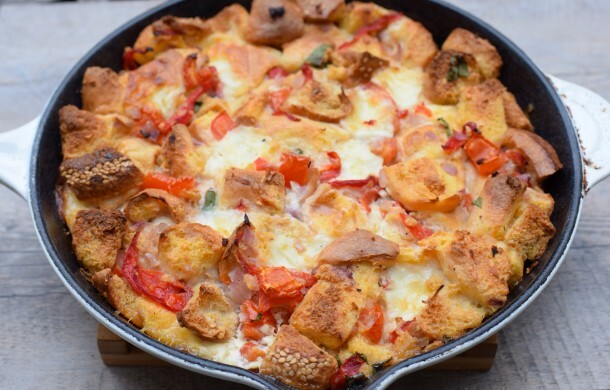 I actually prefer a frittata, but my husband and kids love their bread! 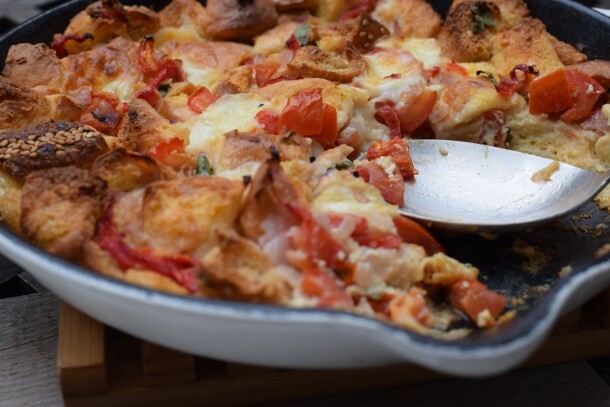 I posted a strata on my site a few years ago with spinach, tomatoes and feta. Super delicious and I love that you can put it together the night before to soak in the fridge and then you bake it in the morning easy peasy. I essentially took what I had — a large tomato, half a red onion, a handful of baby mozzarella balls and a jar of roasted peppers in the fridge, plus some basil from my patio, and combined them with eggs and milk and voila! No one had any idea that I used leftover, previously frozen buns. And no one had any idea they were all different, including a whole grain sprouted bun! Of course, gluten-free buns work equally well. A strata is so versatile that if you had some leftover roasted zucchini, you could throw it in there too. Or a link of leftover sausage or a handful of corn kernels. And if you wanted a higher proportion of eggs, go for it. Just bake until the strata feels “set.” So no liquid gushes out when you push on the center of the strata and it kind of bounces back a bit. 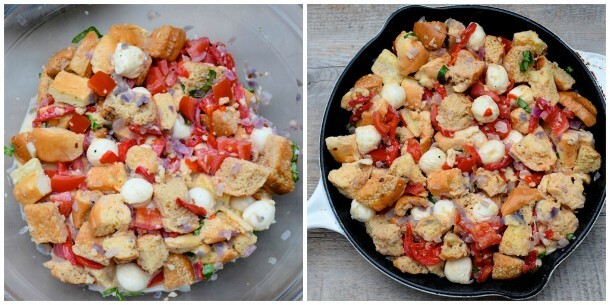 What’s also cool about this is that you can make it for breakfast, lunch or (Meatless Monday) dinner. I served it in these photos with some lightly dressed arugula and I think that’s the best accompaniment or just a simple green salad. But any non-starchy vegetable, like green beans or summer squash, would be great, too. 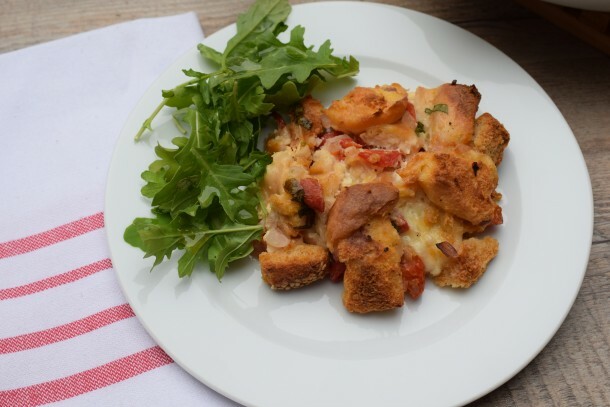 Because bread is the main ingredient, I wouldn’t serve another starch with a strata. But I would serve it with a cold glass of rosé. Happy summer! Warm the olive oil in a large skillet over medium heat. 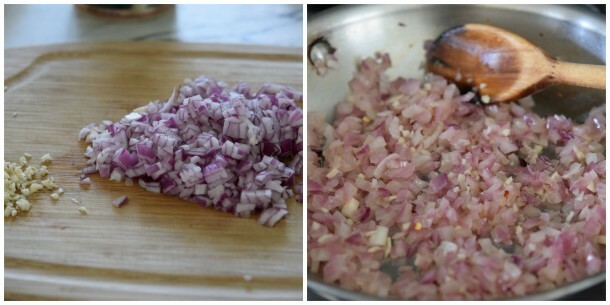 Add the onion and sauté until tender, about 3-4 minutes, add the garlic and red pepper flakes and sauté until fragrant, about 30-60 seconds, then remove from heat and set aside. In a large bowl, beat the eggs with the milk, sea salt and pepper. 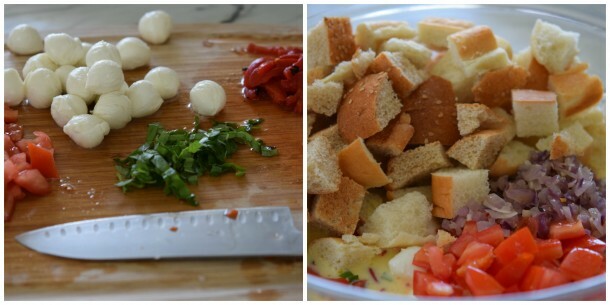 Stir in the bocconcini, tomato, roasted red pepper, basil, bread and onion-garlic mixture, cover with plastic wrap and refrigerate overnight. You don’t have to soak overnight, but I love the way the bread soaks up the mixture. Feel free to put it straight in the oven. If you soaked it overnight, remove the strata from the refrigerator and preheat oven to 375 degrees. Lightly grease a 10-inch skillet (or a 9-inch pie plate or equivalent) with olive oil and pour the strata mixture into the skillet. Bake for 40-50 minutes or until egg mixture is set and top is golden brown. Remove strata from oven and allow to cool slightly. While the strata is cooling, toss the arugula with a drizzle of balsamic vinegar and olive oil (just enough to coat) and sprinkle with salt. 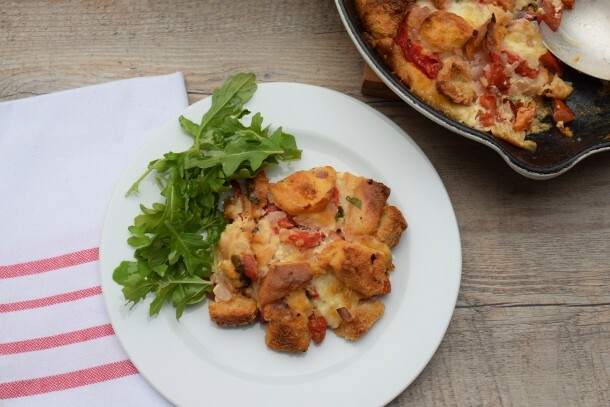 Top the strata with the arugula salad and serve, or cut the strata into serving size pieces and top each piece with arugula salad. Unbaked strata can be frozen if wrapped tightly. Thaw in the refrigerator before baking, uncovered. MINI-STRATAS: grease 4 individual ramekins or muffin tins. First layer bread then vegetables and cheese. Last, pour egg, milk, salt and pepper on top. Refrigerate overnight, if desired. Bake for 25-30 minutes. I looked up “what to do with unused hamburger buns” and this recipe came up. Absolutely amazing! I cooked it in a pre-heated cast iron skillet coated in olive oil at 390 degrees for about 33 minutes (comes right out of the pan without having to scrape it). The first time I made this, I added 8 oz. of Kraft mozzarella instead of the 6 oz. of the baby mozzarella, and then sprinkled some on top when it was done cooking. The second time I made it, I added sliced pastrami on top before putting it in the oven– everybody thought I made a pizza! Thank you so much for the recipe! Super easy, resourceful, delicious, and unique! this came out great. glad to have a way to use leftover buns! Exactly! Why do we always have leftover buns? ?